The 16pf Protective Services Report (16pf PSR™) is a pre-offer selection tool that facilitates the identification of recruits who will deliver on-the-job success by examining how a candidate’s personality impacts his/her work style and job performance. Generated from the 16pf Questionnaire, this pre-offer selection tool is also used for promotional reviews, to select training program participants, and to develop employees in positions of trust, such as law enforcement, security, and asset protection. Proprietary, research-based Protective Services Dimensions that are highly predictive of success in public safety occupations. The four composite Protective Services Dimensions form the foundation of the 16pf PSR. Each dimension is based on comprehensive research with police, corrections, military, and security personnel, making this tool job-relevant and ready to use in almost any public safety and security setting. How an individual adjusts to challenging situations, such as remaining calm and acting appropriately in uncertain or stressful situations. Whether the individual is likely to act in a dependable, conscientious, and self-controlled manner. The respondent’s typical style of decision making and his/her ability to evaluate situations and quickly generate solutions. Reveals the individual’s manner of relating to others and typical preference for independence and solitude versus interaction and cooperation. 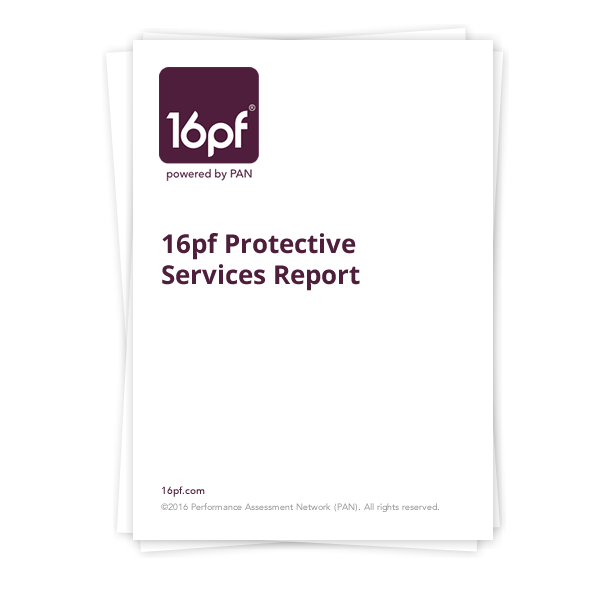 Note: When a broader conditional-offer assessment is warranted, use the 16pf Protective Services Report Plus.